Tight end Allen Reisner, 25, played in five games for Jacksonville last season and finished with five catches for 40 yards. He was also with the Vikings during the 2011 and 2012 seasons. EDEN PRAIRIE, Minn. — In the second week of their offseason program, the Minnesota Vikings added two players to their roster on Tuesday. Minnesota announced it has signed tight end Allen Reisner, who was with the team in 2011 and 2012 as an undrafted free agent out of Iowa before playing parts of the past two seasons with the Jacksonville Jaguars. Later, the Vikings were awarded linebacker Terrell Manning off waivers from the San Diego Chargers. Reisner, 25, played in five games for Jacksonville last season and finished with five catches for 40 yards. He started the season’s first three games and played in two more before a knee injury forced him to the injured reserve with a designation to return. Reisner managed to return, but didn’t play in another game. He played in six games for the Vikings as a rookie in 2011 with one catch for five yards. He had one catch for 13 yards in four games with Minnesota in 2012 before being released and signing with the Jaguars. Manning, 23, was originally a fifth-round draft pick by the Green Bay Packers in 2012 out of North Carolina State. He played in five games for Green Bay as a rookie and one last season for San Diego. He has three career tackles. 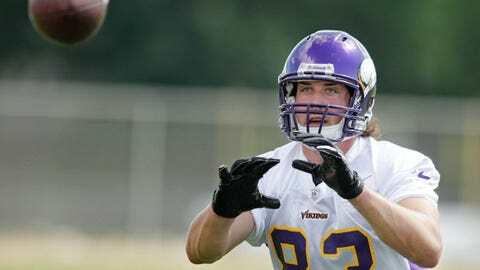 Manning played at North Carolina State with Vikings linebacker Audie Cole. Samuda injured in workouts: Offensive lineman Josh Samuda, signed in January by Minnesota, was injured while working out with teammates in conditioning drills at the Vikings’ facilities on Tuesday. Players are at the facility for voluntary workouts in the first phase of the offseason program. Samuda, 25, fractured his fibula and has possible ligament damage, a source told FoxSportsNorth.com. Samuda is scheduled to have surgery on Wednesday. Samuda (6-foot-3, 315 pounds) was active for all 16 games as a rookie with the Miami Dolphins in 2012.